Gandhi was born in 1869 in New Delhi. He married at the age of 13 ( as was the custom in that town) and at 18 he went to England where he studied Law and became interested in the study of the Bible. When he grew up, Gandhi became a great master for the people of India, his homeland. This has helped many people in difficulty, always teaching them to love and forgive. He had a certain admiration for Protestant Christianity, but, disappointed with the procedure of some Christians he returned definitively to Hinduism. He also lived in South Africa. When he returned to India, he stood in front of revolutionary movements, but always without allowing violence. For 30 years he led three campaigns that led India to independence in 1947. Gandhi was murdered the following year by a Hindu fanatic. After two hours of his death, the Prime Minister, Nehru, appealed to the people of India to face the tragedy in the spirit of Gandhi. 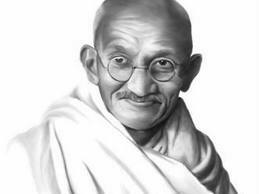 They called him Mahatma that means “ great soul”.